Get the scoop on CRM vendors in this free research note from Nucleus Research. It’s much easier to make a case for a new CRM system when you can prove to your executives that your new solution will deliver a reliable return on investment. Nucleus Research has identified two CRM characteristics that typically lead to ROI—and they’re sharing their findings with you. 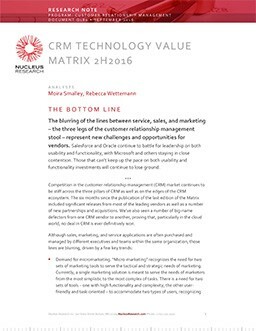 In “CRM Technology Value Matrix 2H 2016,” you’ll get an honest assessment of the current CRM market. How leading vendors stack up in terms of sales, marketing, and service. Why the increased demand for micromarketing is forcing change in the market. Why companies are rethinking the traditional sales funnel—and what’s replacing it. How the right CRM can help your service agents become sales generators. What to expect from CRM vendors in the months to come. Don’t miss this chance to accelerate your CRM selection process. Enter your information, and this research note will be yours in seconds. This research note is provided by Acumatica, a leading provider of cloud business management software that empowers small and mid-size businesses to unlock their potential and drive growth. Acumatica is doing all the right things to bring speed, flexibility, and adaptability to its customers and prospective customers. It is developing its platform and application at an impressive rate.